We support the Coshocton Co Skywarn. 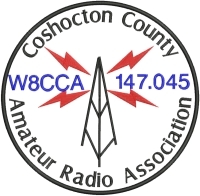 We support the Coshocton, Ohio Amateur Radio Volunteer Examiner Team (COARVET) which is affiliated with the ARRL VEC. We make available, an annual licensing class. We hold an annual Field Day outing. We have an annual Family Picnic/Fox Hunt. We promote amateur radio, and amateur radio emergency services through participation in community parades, public appearances, library displays, and public service announcements via local newspaper and radio.